If you ever already been tried to replace a new replacement LCD screen in Samsung Galaxy Core Prime Duos SM-G360H and nothing happens but the display problem still exists like, black screen display, blue screen display, white screen display, garbled and saturated screen display. 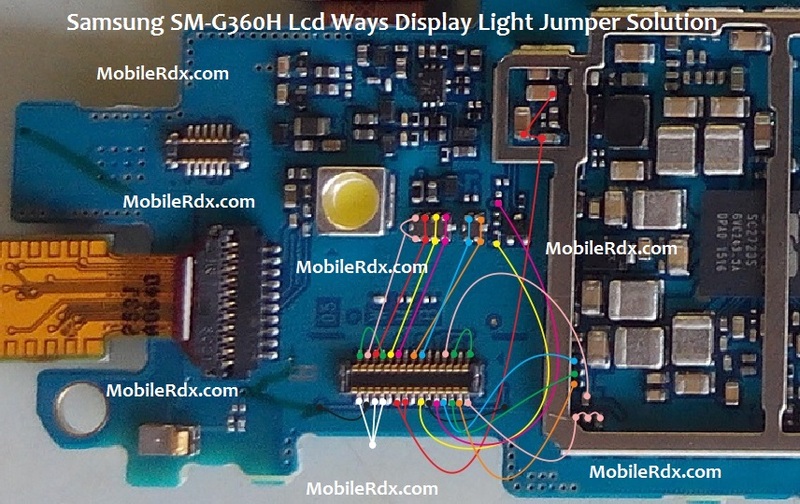 Refer to the solution below and do trace the LCD soldered pads connector down to the corresponding components such as the resistors and filter coils. The resistors has as resistance value each, you may also check these voltages. This also includes the connection line paths of the LCD backlight LED, to fix if the white LED at the back of the LCD doesn’t turns ON and shows a dark display. Before replacing those display filter IC you may check each of its corresponding line path first for ensuring that all the lines is okay. Make a continuity test from the Filter chips solder ball bumps through to a certain pins on the B2B connector.